"Taser", the popularly used term for any make of stun gun... it's the new buzzword (pardon the pun) on the news and online. Now stun guns are being marketed to women and the offerings run the gamut from shockingly sexist to insufferably cute. Stun guns are only the latest salvo in the battle for personal security, and manufacturers have devoted extra attention to the women's market. Let's look at three examples of women's stun guns... and take a glimpse into the minds of the obviously male marketing execs who thought them up. "Strong enough for a man, but made for a woman"... OK, that's the Secret deodorant slogan but that's what comes to mind when we see the The Pink Stinger. It may look like a novelty item (and in some respects, it is), but The Pink Stinger is designed to be a working stun gun delivering 50,000 volts to anyone unlucky to catch the owner on a bad PMS day. 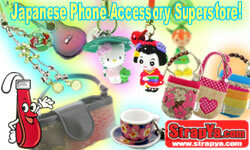 The cleverly disguised device also works in stun mode for tight situations. Just don't mistake it for the real thing, ladies... unless you're a fembot. The Pink Seal - Tokyo Perverts, Beware! 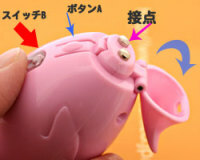 OK, it's not really a "taser", though The Pink Seal can deliver an electric shock that may surprise and distract perverted perps. Against Japan's omnipresent subway gropers, an unexpected shock may just do the trick. Using it on a desperate American-style junkie-mugger might be a little like kicking a wasp's nest though. And there you have it - a trio of women's stun guns that themselves should get women angry enough to use them against you. "Make it cute, and make it pink" seems to be the Average Guy's mantra when it comes to understanding what women want and need. Not really all that, er, shocking when you think about it. 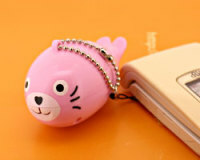 Editor's Note: There is also now a small pink stun gun that is very inexpensive and very well reviewed. You can take a look at the pink stun gun here on Amazon. 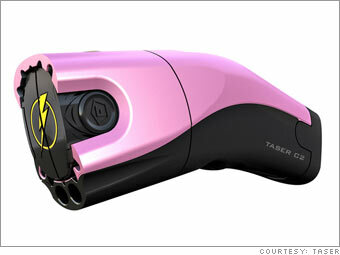 TASER® is a Trademark of TASER International, Inc.
You can find the C2 Taser in Pink and a lighter pink color called Fashion Pink at ExtremeDefenseShop.com on sale for only $329.95 with free shipping. It's the best deal on a new C2 Taser I've found. Got one for my girlfriend. haha, it does seem pretty sexist, but not surprising coming from a company stuck in the 1950s.